Are you planning on remodeling your bathroom, or need more storage in the bathroom you have? 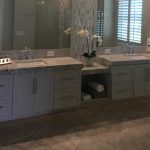 Let Sunset Custom Cabinetry and Woodwork create custom bathroom vanities, and cabinets specially made to fit your bathroom, and personal style. No custom bathroom vanity would be complete without equally impressive custom bathroom cabinets. One, two, or ten, all cabinets can be perfectly measured for the right amount of storage needed to fit individual requests. All of life’s bathroom necessities can fit, and also, be concealed behind your bathroom cabinet doors. Create the Bathroom Cabinet of your dreams. Choose from a wide range of materials, styles, and hardware to your own personalized creation. Create new storage space in your bathroom that matches your decor and fits perfectly. Custom bathroom cabinets can become eye catching by the type of cabinet doors. Square or rectangle shapes can be made with even more details of paneling to give one of a kind character. 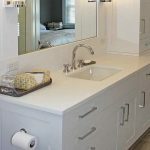 A personal conversation with one of our team members can ensure that the uniqueness of each piece of a customer bathroom vanity will come to life. Replacing your bathroom cabinet doors is a less expensive way to update the look of cabinets and vanities. Choose every detail, we can replace your outdated cabinet doors with custom built replacement. Save even more by choosing from our wide variety of factory built doors. The amount of possibilities for bathroom cabinet designs are plentiful. 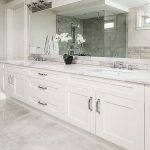 Whether it be floor to ceiling, or inspired by an image in a magazine – the designs behind a new bathroom cabinet can come to life by our expert craftsmen. A wide range of elegant Bathroom Cabinet Designs, top quality materials and styles. Pre-made store bought bathroom wall cabinets never come in the right color and most certainly never the right shape or size. 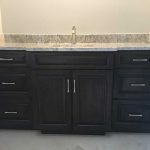 However, our custom wall cabinets will be shaped to fit and complement the size of your bathroom and will certainly have the right amount of shelving – small or large enough to hold bins. They can even be sleek and minimal or have added accents to match vanities. Additionally, even in small spaces, bathroom wall cabinets help solve this problem by making the most out of a small space. Functionality and organization can be achievable from our bathroom storage pieces. 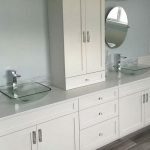 Whether it be one shelve to match your custom bathroom vanity or a slim tower with multiple shelves, all of the bathroom necessities and supplies will have a place to rest concealed behind closed doors or out on display, the choice is yours. 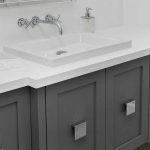 The wait is over – no more waiting in line, upgrade to a double sink vanity! Out with the old and in with the newly updated bathroom double sink vanity paradise. Contemporary, Traditional, Modern, or Victorian we can make your paradise come to life. Come talk to one of our team members to decide on which options will be best for you. 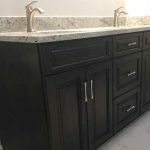 Match your custom bathroom vanity style to your custom bathroom cabinets for a complete look. You’re sure to find the perfect pairing with our wide range of styles and colors. The style outside aligns with a functional inside with just the right amount of shelving and storage. Furthermore, our qualified team members communicate your designs and must haves to our expert craftsmen. Specially designed for your bathroom for the best fit. Custom designed by you to match your style and taste. 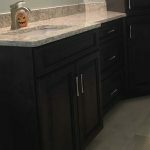 A popular choice in bathroom cabinets are shaker cabinets. Why? Because their durability and ability to go with almost any style of custom bathroom vanity. Also, shaker cabinets can be added to all lifestyles. 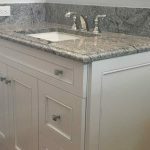 In summary, bathroom Shaker Cabinets add a great classic look with a touch of elegance. Just ask our expert craftsmen. Needing to add extra storage space to a bathroom? Over the toilet cabinets are the perfect addition to conceal or display all of the bathroom supplies and necessities. Shelving, draws, large square cubbies to hold bins – the options are yours. They come in all different sizes and shapes to fit all unique bathroom perimeters. Looking for a company that has excellent craftsman? 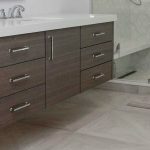 There are few experts in the field of custom bathroom vanities and all the details and pieces that go into one. Well, finally, the search is over! Sunset Custom Cabinetry and Woodwork is your answer. First, talk with our team members. Then, watch your dream styles come to life. If you are ready to add a touch of elegance to your bathroom, call us now!